To Jack, Samir is his best friend ever. To Miss Doover, Jack and Samir together are nothing but trouble. Jack offers to give Samir his whoopee cushion if he will sneak it into Miss Doover's desk chair. And when Mr. Humphrey, the principal comes in to announce that the field trip is canceled, the two boys titter at Jack's drawing of "Mr. Harrumphry." Mr. Humphrey is not amused at his likeness. Miss Doover is embarrassed at the behavior of her students. Miss Doover sank into her chair, her head in her hands. Jack and Samir are re-assigned seats--on opposite sides of the room. And the next day, when Jack tries to persuade Miss Doover to give them a do-over, she has an idea. "Class, Jack and Samir have given me an idea! For today's writer's workshop, write a four-sentence persuasive essay." Samir hands his essay in quickly. Miss Doover should not have confiscated the whoopee cushion. Jack gave it to me. I have a burning need to put it in my dad's chair at home. Miss Doover doesn't even like it. Jack's essay has only two sentences. I'LL DIE IF I CAN'T SIT NEXT TO SAMIR. People will be sobbing at my funeral. 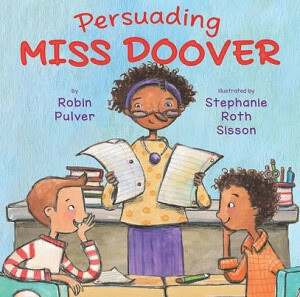 Threats, bribery, and hyperbole don't work: Miss Doover is NOT persuaded. Will the two best friends get the point of this lesson at last? In Robin Pulver's latest. Persuading Miss Doover (Holiday House, 2018), Jack and Samir may be a little slow on the uptake, but young readers will laugh at the class's first lame arguments for chocolate chips instead of raisins in the cafeteria cookies and how two-hour recesses will help them have fun learning. But thanks to Miss Doover's persuasive efforts, the two partners in mischief do learn their lesson. Stephanie Roth Sisson's classroom illustrations are spot on, and readers will actually have fun with this lighthearted lesson in writing and school behavior. Share this one with Pulver's first book, Thank You, Miss Doover, in which Jack learns how NOT to write his great-aunt a thank-you note.